Temperatures have started to climb in our part of the world, with humidity following suit. So we’re looking for pre-dinner drinks that are refreshing, but not filling. Good thing we found the Bamboo Cocktail—a tasty combination of sherry and vermouth. It loads on the flavor, but goes light on the booze. So your mom would love it. Which is handy, since Mother’s Day is coming up this Sunday. Sip it while singing her praises. The Bamboo Cocktail was invented by Louis Eppinger, manager of the Grand Hotel in Yokohama, Japan. Eppinger, who was born in Germany, learned to tend bar in San Francisco. He devised this cocktail sometime in the 1890s, though no one knows what inspired it. 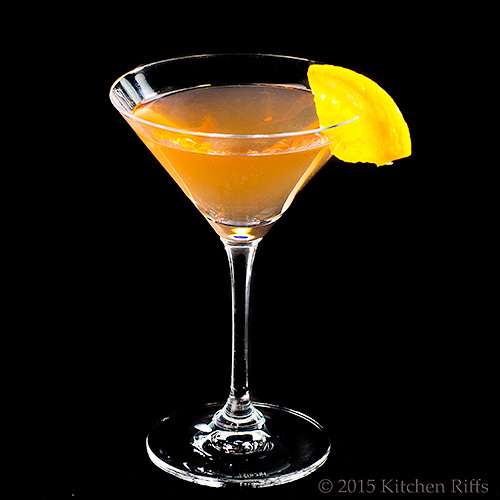 We do know that it was popular at his hotel bar—and that the recipe soon traveled throughout the world. Sherry and vermouth (the two main ingredients in this drink) are both fortified wines, with an alcoholic content that usually runs around 17% (34 proof). By contrast, most spirits (like gin or whiskey) are 80 proof and up. Because sherry and vermouth are so low proof, they can oxidize quickly once they’re opened, making their flavors less bright. So we always store the bottles in the refrigerator after we open them. We think this drink tastes best when made with a fairly dry sherry (see Notes). Combine all ingredients (except garnish) in a mixing glass half-filled with ice. Use a long-handled spoon to stir briskly for 20 to 30 seconds, until well chilled. Strain into a cocktail glass (preferably one that’s been chilled). Add garnish, if using, and serve. Why stir rather than shake this drink? Because the ingredients are clear. Shaking tends to introduce small bubbles, which make a drink cloudy. This is not a problem when the ingredients are opaque (think citrus juice), but it can be unattractive when the ingredients are clear. Bitters add flavor (and some color) to this drink, so they’re important. But feel free to experiment with the type of bitters you use. We would definitely suggest orange bitters, but another aromatic bitter could be substituted for Angostura. There’s a “perfect” version of this drink that’s worth trying. 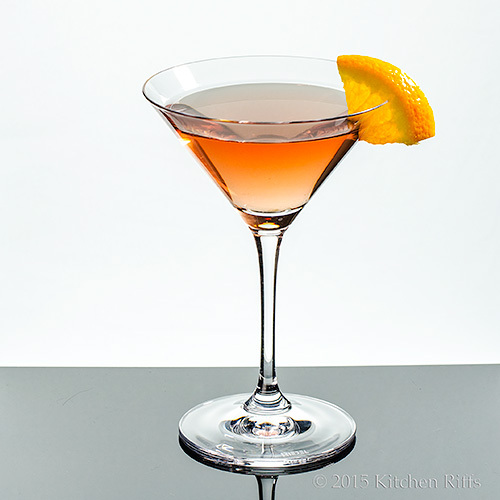 In cocktail parlance, a “perfect” cocktail means one made with equal parts of sweet (red) and dry (white) vermouth. So to make a Perfect Bamboo Cocktail, just substitute ¾ ounce each of sweet and dry vermouth for the 1½ ounces of dry vermouth specified in the recipe. 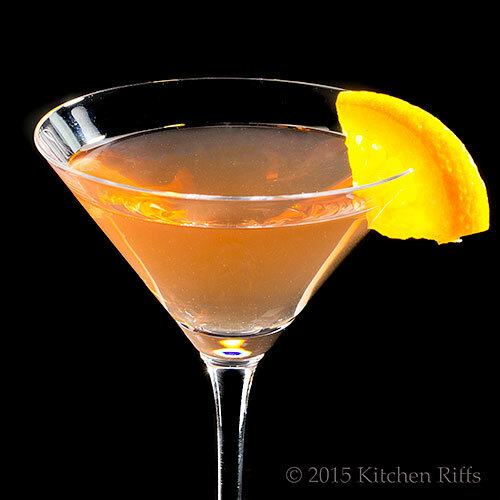 Our recipe reflects the standard modern ratio for this drink (a 1:1 ratio of sherry to vermouth). Originally, however, Eppinger may have used 3 parts sherry to 1 part vermouth. It’s an interesting variation—but not as good in our opinion. Sherry originated in the Cádiz province of Spain (specifically, around the town of Jerez de la Frontera). This region has produced wine for over 3000 years. Sherry was developed after Moorish invaders introduced distillation to the area, probably sometime during the 8th century AD. In the EU, any fortified wine sold as sherry must be made in a specific region of Cádiz. In the US, however, “sherry” can be used as a generic name for domestically produced fortified wines. There are numerous varieties of sherry. Fino is the driest (and probably the best known); it typically has a very pale color. Amontillado is darker, and oloroso is darker still. Wikipedia offers a useful list that describes the different types of sherry. For this drink, you should use a sherry that’s fairly dry. So try a fino or amontillado. How much should you spend on a bottle? Well, some sherries are quite expensive, but you don’t need those for cocktails. Something in the $10 to $15 range should work quite well. Louis Eppinger also created several other drinks, including the Million Dollar Cocktail (a mix of gin, sweet vermouth, pineapple juice, grenadine, and egg white). That’s a nice one—we owe you the recipe. “Yes, this is a drink I could warm up to,” said Mrs K R.
“Glad to warm the cockles of your heart,” I said, reaching for bottles. I just wish I was craving a light cocktail for warm weather. Thankfully it's not snow but it's a chilly rain and we are just on the cusp of spring starting...so give me a couple of weeks and then I'll be dying to try this! No being a big fan of dry sherry but a huge fan of dry vermouth, I think this is a simple little cocktail that I should try. Just the color of it makes me want it. :) Interesting that a German born, trained in the US, and now in Japan invented this. Interesting. Nice cocktail for all the mothers out there and then some. Thanks John! Lovely cocktail John. I wish I was your neighbor so I could be your taste tester. Can't wait to try this one. Hi Barb, this will be perfect for you in a few weeks. ;-) Thanks for the comment. Hi Greg, I'll take any opportunity to say apéritif. ;-) But it's better to say it during warm weather, I agree. Thanks for the comment. Hi MJ, I found the international background of the creator of this drink interesting too! It's a big world, but small one at the same time. Thanks for the comment. Hi Karen, we need taste testers! Luckily we have some good friends who help with that. ;-) But more always needed! Thanks for the comment. Hi Pat, you should have one for Mother's Day! Thanks for the comment. This drink reminds me of warm weather and sunshine. It sounds quite tasty. You always concoct unique drinks. We're you ever a bartender? I think you should write a beverage cookbook. I'd buy it! I have all the ingredients on hand except the husband to make it for me. He'll be back Friday. Good thing. I need some cockles warmed! Haha - I like Mrs. K.R. 's motto "Cold glass, warm cockles" is it going to replace "Season to taste...cook till done"? Gorgeous coloring and again, I learned something new - I had no clue there were many types of sherry! What a clean shot! Love the color of this cocktail! Looks like a perfect light drink for the warm season. Hi Dottie, this is definitely a lighter cocktail (both in terms of flavor and alcohol), so I think this would make you happy. And we'll definitely be enjoying another of these! ;-) Thanks for the comment. Hi Vicki, no experience as a bartender -- taught my self. As I did cooking. ;-) Thanks for the comment. Hi Abbe, well tell the Manservant to hurry up and make it Friday so you can enjoy one of these! ;-) Thanks for the comment. Hi Shashi, we're tempted to make that replacement! ;-) Sherry is a wonderful drink -- loads and loads of them out there. A really fun beverage! Thanks for the comment. Hi Holly, this is a nice and light drink. Perfect, as you say, for this type of weather. ;-) Thanks for the comment. Hi Tricia, this is such a cool drink (in more ways than one!) -- definitely one worth trying sometime. And yes, you do need one for Mother's Day. ;-) Thanks for the comment. Hi Nee, you might want to send Hubby a link to this post. ;-) Thanks for the comment. Another cocktail I had not heard of until today, I know I'm the most knowledgeable non drinker around :) thanks to you! Beautiful as always and I'm sure moms who drink will really appreciate it! This sounds like a beauty, John. I have a fondness for bitters! Hi Nazneen, glad you'll get snowy weather for Mother's Day! We'll have AC. And one of these to cool ourselves. :-) Thanks for the comment. Hi Liz, bitters are wonderful, aren't they? They're the seasoning for cocktails! Thanks for the comment. A low-alcohol cocktail is a wonderful thing. I often hesitate to order cocktails at a restaurant because I don't want to feel too buzzed if I have to drive home. So, I often opt for wine instead. But a low-alcohol one solves that dilemma. Plus, this one is so pretty. John this is a very classy drink. Elegant and sophisticated and a perfect start to any Mother's Day feast. Oh my goodness I know just what you mean about the humidity. It is 100% humidity in HK and it is already 30 degrees celsius and it is only 8:30 am... Your photos are just gorgeous as usual and will like my cocktail stirred and not shaken. Sharing and pinning!!! Boy, it felt like summer today! One of these light, tasty cocktails would have been perfect to sip on before dinner. I always get a smile when your site loads and I see a lovely cocktail such as this one. Terrific information behind the drink, and a fun, closing conversation too! This looks awesome. I'm in love with the color. Thank God for spring! Hi Anne, isn't this a great drink? And I love the color, too. One of the neat things about the color is it'll change a bit depending on what bitters you use (and if you replace half the dry vermouth with sweet, the color is even prettier!). Thanks for the comment. Hi Carolyn, the alcohol in this is probably about the same as a glass of wine (assuming the glass of wine is at least 4 ounces), so it's a great drink when you're driving. Tasty, too. ;-) Thanks for the comment. Hi Bam, we haven't hit 100% humidity yet, but it won't be that long. Alas. :-( Thanks for the comment. Hi Pam, you get to celebrate twice -- Mother's Day and birthday! So you get to have this twice. ;-) Thanks for the comment. Hi GiGi, :-) I seriously considered some panda jokes! Thanks for the comment. Hi Liz, we've actually had a pretty cool spring, but the last week or so it's really warmed up. Just the weather for this sort of drink! Thanks for the comment. Hi Zoe, yup, you're looking for warming drinks, not cooling ones! Plenty of those around, thank goodness. ;-) Thanks for the comment. Hi Brooks, we always like doing cocktails too! Particularly the research. ;-) Thanks for the comment. Hi Minnie, after all the snow you got, spring must be really welcome this year! Thanks for the comment. Hi Charlie, bitters are so nice, aren't they? And they add quite a bit of the color to this drink. Thanks for the comment. This beautiful cocktail reminds me of sunset, just look at pretty colours! Hi Jasline, this really is a pretty one, isn't it? And it tastes even better! Thanks for the comment. My husband and I would both love these classy cocktails. YUM. Hi Rocquie, it's a pretty shade, isn't it? And I was really tempted by panda jokes. ;-) Thanks for the comment. Hi Pam, it's a delish drink! You'd definitely enjoy it. ;-) Thanks for the comment. This reminds me that summer is just around the corner :) Great cocktail! Yay!!!! Cocktail Post!!!!! Love the name. I also like that's it's light on the booze. Cold Drink--Warm Cockles????? I am laughing----Man that was pushing it. My mom is always saying she'd like me to make a drink for her, so I'll have to give this a try! Hi Kristi, always nice to see summer again, isn't it? Thanks for the comment. Hi Carol, this is a really cool drink. ;-) Thanks for the comment. Hi Laura, bet your mom will like it. You, too! Thanks for the comment. Hi Peachy, it is, it is. ;-) Thanks for the comment. Hi Juliana, it's a nice drink -- so tasty. Thanks for the comment. Hi Marcela, always happy to make a sale! :-) Thanks for the comment. John, you always make such beautiful drinks. I don't drink a lot of alcohol, but this sounds perfect for a warm spring day like we had to day. Hi Dawn, this is such a great drink for a warm spring day! Very flavorful. ;-) Thanks for the comment. My mother-in-law loves sherry and she'll be here for Mother's Day. I'll make this for her in your honor! Hi Maureen, I'm honored you're making this for your MIL. ;-) Thanks for the comment. Hi Lux, I'd say so too! ;-) Thanks for the comment. A fun and pretty drink. Looks perfect for any occasion! Hi Chris, it really is both a fun and pretty drink. And awfully good! Thanks for the comment. 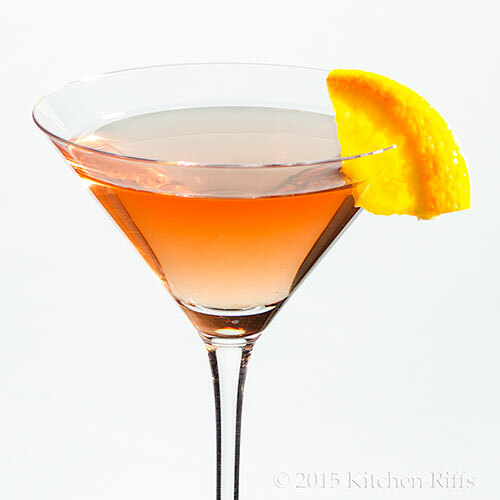 Sherry and Vermouth is such a perfect combination and the color looks like sunshine in a glass! Hi Daniela, isn't that a great combo? The two really play together so nicely! Thanks for the comment. Low alcohol, sweet and refreshing sounds great for a cocktail. Have a super Sunday! It looks and sounds wonderful! A glass in the evening will be great. Hi J&A, it's a wonderful drink. ;-) Thanks for the comment. Hi Candy, this is so nice! You'd definitely enjoy a glass of this. ;-) Thanks for the comment. What mom wouldn't love this? Hi Debra, this is such a nice drink, everyone would like it! ;-) Thanks for the comment. You've taught me something new yet again. I didn't know that definition of "perfect". Now I'm trying to figure out how I'll use it in conversation today! I always learn so much from your posts, John. (And I always laugh at the witty repartee you share with Mrs.KR) Although I've always thought of sherry as a "little ol' lady drink" -- or just something to add to the custard for my quiche -- I'll have to take a second look. Hi Beth, just ask for a Perfect Manhattan and you'll be good to go. ;-) Thanks for the comment. Hi Rosemary, much of the sherry sold n the US isn't all that interesting, although it's fine for cocktails. But a good wine store will have some really good sherry -- there's good stuff out there. Worth checking out sometime. But that's sippin' sherry -- too good to use in a cocktail! Thanks for the comment. Hi Kumar, this really is such a nice summer cocktail. ;-) Thanks for the comment. This is such a pretty colour, sounds great. Hi Caroline, this really is a nice color! Not to mention nice drink. ;-) Thanks for the comment. It's definitely warming up around here, too! It went from winter to summer and skipped spring! I love the idea of a pre-dinner cocktail and this one sounds nice and refreshing. Hi Dedy, I'll bet you can handle this! ;-) Thanks for the comment. Hi Amy, we've had a fairly cool spring this year, but it's definitely time for the AC now. Well, except for today -- really moderate temperatures. Love how changeable this time of the year is! Thanks for the comment. Uh.. If i only could drink it right now... Looks terrific! Hi Marcela, it is terrific! ;-) Thanks for the comment. I just adore cocktails served in a martini glass. So pretty and classy looking. Love the shots on black, very moody. Hi Eva, classic cocktail glasses have such a nice shape, don't they? I really like their looks too! Thanks for the comment. Hi Maria, isn't this such a nice drink? Loads of flavor, and quite refreshing. Thanks for the comment. It has beautiful color! I'm drawn to it. You made an interesting point (and lesson for me) about shaking and stirring the drink. This kind of knowledge is very important. I often make a mistake and find out something is not right... It's a simple thing that makes a huge difference for outcome! I love learning new things from you (as always)!! You'd host a great cooking class! Hi Nami, it's OK to shake drinks that you "should" stir, and stir ones that are normally shaken. We break the rules all the time! :-) Thanks for the comment. Hi CEE, it's a fun drink. Tasty, too. ;-) Enjoy! And thanks for the comment. As always, it is delightful to see what your latest cocktail offer is for us. This is certainly pretty enough to present on Mother's Day. Hi Suzanne, isn't this pretty? And I love its flavor! Thanks for the comment. Hi Anna, hope you're having a great Saturday night! Thanks for the comment. Ever widening my cocktail knowledge John! I LOVE this one. Its provenance is interesting and sounds perfect for your oncoming heat. In other news, its freezing here in Sydney! Hi Amanda, sounds like you need a hot toddy! Thanks for the comment. The Negroni is my favorite, and this aperitif sounds like it is in line with it. I can't wait to try. Hi Cakespy, isn't the Negroni a wonderful drink? One of my favorites! This is also very nice, and lighter than a Negroni.Like the Negroni, this is wonderful in warm weather. Or winter, for that matter. ;-) Thanks for the comment.